Its September and the year is 1877. Maurice Thompson is flush with success after the simultaneous publication of "Hunting with the Long-Bow" in Harpers Monthly Magazine and "Bow-Shooting" in Scribners Monthly two months earlier. Within a year Maurice will publish The Witchery of Archery. Maurices home state of Indiana is relatively civilized, but conditions to the west are less settled. It has only been a year since the Custer Massacre on the Little Big Horn. Near the head of the Elkhorn River in western Nebraska, 14 year old William Compton slips up on a blowout [a wind eroded, hollowed out hill peculiar to the great sand hills located in this area] to check for bedded deer. He hopes to catch one unaware and get a shot with the ash bow he carries. Its a ritual young Compton has played out several times over the past month, but until now the deer have always evaded the youngsters determined attempts. "When I peeked over I saw the tips of a deers ears about ten yards in front of me, and about twenty feet down. I know he was lying on a sort of shelf up from the bottom two or three feet and close in to the bank to get out of the wind. I nocked my arrow, got into position, and stood up suddenly in full view of Mr. Deer. He jumped to his feet and stood looking at me almost broadside. I remember that I drew steadily and loosed sharply. The arrow caught him just a little quartering and pierced his heart almost exactly in the center. He stood for a second or two as if paralyzed, and then gave two or three short spasmodic jumps and fell over backwards, as dead as Julius Caesar. I fell off the edge of that blowoutdidnt take time to climb down or walk around the opening to get my deer. I believe that nothing could have surprised me as much as that deer did when he fell down and did not try to get up again. When I got beside him I found he was a little spike buck. I never looked any further, and the only spots I touched between that butte and camp were the high ones. I knew father and Ames would be in camp curing jerky, and was more than anxious to get near something human to help share my joy, for it was far too generous in its proportions for me to handle alone. When I hove in sight, going at a speed no stop watch could catch, and the wind blowing straight through meI had on no clothes worth mentioningthey both jumped for their old needle guns as they thought that about twenty young Sioux were on their trail. Old Dave said afterwards that no Injun pony on the plains could have caught me. After they had disbelieved me for a while, we all went back to the butte, and when we walked into the blowout my deer was still there." William John Compton was born in Flint, Michigan of the 28th day of September, 1863 and moved to Norfork, Nebraska seven years later with his family. Comptons early years were influenced by the local Sioux and reportedly he was adopted into their tribe. He became adept at making the Sioux style bows, making and straightening arrows and stalking game under their tutelage. According to W. B. Wescott, "Much of the quiet wisdom and deep humility which so profoundly affected those who came to know him in later life he accredited to the Indian tutors of his boyhood." Compton lived and worked in Nebraska, Wyoming, Montana and Oregon during his early years. Still, with all the rigors of making a living in this wild and largely uncivilized western country, he continued his hunting with the bow. A letter written to H. H. McChesney in 1916 and published in the January, 1950 issue of Archery, chronicles these early years and according to it, he accounted for at least 20 deer, five antelope, a couple of elk and even put an arrow in a bison which was finished by Indians with guns during this period. This is a lifetime tally for many archers, yet Compton accomplished all this by his 20th birthday with primitive Indian bows of his own manufacture. He closes the letter with the following, "I will add that I did not know that there was another white man in the world shooting a bow till 1908 or 1909." Compton was in Montana when he first heard of the Oregon bowyer, F. S. Barnes. In 1894 he moved to Oregon and began working for Barnes harvesting yew and learning the art of making the English long bow. Compton learned his craft well and upon the death of Barnes in 1913, he packed up about 1000 fine yew billets Saxton Pope later referred to as "an unlimited supply of yew wood" and moved to California. Soon after his arrival he visited Ishi and met Dr. Pope. He was instrumental in introducing Art Young to Dr. Pope and instructed both in making and shooting the English long bow. Compton taught and influenced a number of noted archers to include Stanley Spencer, Frank Crandall, Donnan Smith, Dr. E. K. Roberts, Chester Seay, Samuel B. McMeen, Cassius Styles and Erle Stanley Gardner. Compton, Dr. Pope, Young and Ishi shot and hunted together, but it was only after Ishis death that the remaining trio began hunting in earnest or as Dr. Pope phased it, "Then our serious work began. We found it.....a delightful way of hunting." It was during this period that Dr. Pope and Young bestowed the name of "Chief" on Compton when they learned of his early association with the Sioux Indians. Cassius Styles would later comment that Compton "was a striking figure; that the plains had molded his features into a profile much like that of a Sioux; that his speaking voice was rich and manly while his singing voice was an excellent bass." He goes on to say that "it is tragic that Compton, who really was the mainspring of the hunting idea in that heroic triumviratePope, Young and Comptonis almost forgotten." The "Chief" was well known for his superb craftsmanship, even back in those early years, as is evidenced by the following anecdote: "He [Compton] had a flat tire, had to remove some of his tackle in order to get at his car tools, and drove away leaving one of his bows by the roadside. A passing motorist picked it up. He didnt know what it was but, seeing that it was made of highly polished wood, took it to a furniture store in Santa Paula [California] where it was placed in a display window. Someone decided it was a bow and, knowing that Dusty Roberts had been doing some bow-and-arrow shooting, told him about it. Roberts bought the bow for a dollar and a half, tried it out and decided then and there that there was only one man in the country who could make a bow such as that one was. He wrote to Compton asking if he had lost a bow; and the Chief came in a hurry, to weep on Dustys neckwith gratitude, we may be sure. It was Will Comptons favorite 80 pound mountain lion bow." Like many, "Chief" was partial to certain bows. In an early article published in the February, 1917 issue of Forest and Stream titled "The Bow of Yew," Dr. Pope mentions a couple. "His [Comptons] favorite bow, noted for its brilliant cast, pulls 65 pounds. It is light enough for small game and heavy enough for large. He calls it Wolf Voiceafter an old Sioux Chief. Another bow, pulling 80 pounds, which few men can shoot, he calls Old Horrible. It could drive an arrow through a buffalo." Compton never became the adventurer as Art Young or the writer as Dr. Pope, much preferring the less public. His good friend Ray Hodgson put it well, "Compton never went in for publicity. He quietly went about helping others. He was a grand instructor and an enthralling lecturer. I have always wondered why Will Compton never got his name mentioned as an inspiration to the archery world. Here in the West there never was a man who sold the sport of archery so thoroughly as did Will Compton. Pope, of course, was capable of writing; Young traveled and lectured; but Chief Compton started them all. He was the root. We were all his pupils and all of us oldtimers speak of Compton as being responsible for it all." 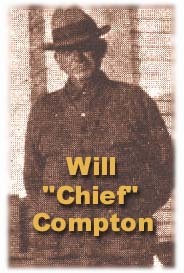 William John "Chief" Compton passed on to a higher calling on May 16, 1938, the last of that great trio, Pope, Young and Compton. In honor of and gratitude for his unheralded contribution to archery, the National Field Archery Association [NFAA] named their most prestigious award, the Compton Medal of Honor.